Head football coach Kevin Porter and the Fort Valley State University Wildcats will open the 2016 season in a televised game on Sunday, September 4, with Miles College in Birmingham, Ala. (The Labor Day Golden Classic) at 4 p.m. This will be the first of two televised games to broadcast on ASPiRE TV this season, as announced by the Southern Intercollegiate Athletic Conference (SIAC) on Tuesday, June 28. The Wildcats’ second spotlight on ASPiRE TV is Saturday, November 5 in Columbus, Ga., with FVSU hosting the Albany State University Rams in the 27th annual Fountain City Classic at 2 p.m. The SIAC will broadcast four games on ASPiRE this upcoming football season. ASPiRE TV is available in the Fort Valley area on DIRECTV, channel 381. 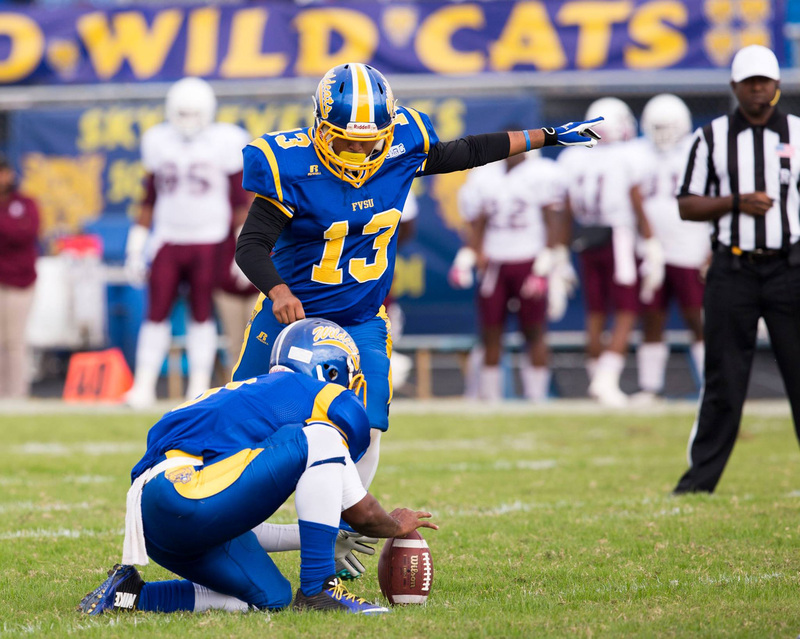 Sunday, September 5 – Fort Valley State vs. Miles – 4 p.m.
Saturday, October 8 – Morehouse vs. Tuskegee – 2 p.m.
Saturday, November 5 – Albany State vs. Fort Valley State – 2 p.m.
Saturday, November 12 – SIAC Football Championship – 6 p.m. Note: Tickets for the 2016 Wildcat football season will be available July 1 at WildcatTicketOffice.com. Click here to download the football schedule. ASPiRE is a television network that celebrates the groundbreaking achievements of African-Americans. ASPiRE offers a diverse programming mix of movies, series and specials featuring music, comedy, drama, faith/inspiration, theater/performing arts, lifestyle and news/information. The network was launched June 27, 2012 by Magic Johnson Enterprises, which acts as a catalyst for driving unparalleled business results for its partners and fosters community/economic empowerment by making available high-quality entertainment, products and services that answer the demands of ethnically diverse urban communities. ASPiRE is available in over 20 million homes in 22 of the top 25 African-American markets including New York City, Los Angeles, Atlanta, Chicago and Washington, D.C. For more information, visit www.aspire.tv, facebook.com/aspireTV and on Twitter @tvASPiRE.